The price was very fair and I would highly recommend Hayden and Elite carpet cleaning to my friends and work colleagues. "From our very first contact with Elite over the phone, we were impressed. Rowanna was kind, pleasant and professional and her customer service was one of the reasons we opted for Elite over the other two companies we obtained quotes from. Hayden was our technician and we have nothing but the highest praise for his work. He arrived on the dot of 8.30, finished on time, did a beautiful job of cleaning our carpets and was pleasant and cheerful. We're very happy with the service and quality of work… from Elite and would have no qualms about recommending them." "Elite is awesome, I had a major with my carpet, I contacted them, they said they could come tomorrow (as in next day) I was like, NO today, they had some one here that day within a couple of hours!! Awesome company, i have used them before and they have always been great!! Fantastic company and great operators, would highly recommended this company to anyone without hesitation." "Hayden did a fantastic job at repairing Ann relaying the carpet after I moved a door and wardrobe. You would be hard push find the joins they had to do. He was very professional and check that I was happy with his work before he cleaned up and left.There price was very reasonable and they would be the first company I would call in the future." "Highly recommend Elite Carpet Cleaning. Brendan and Hayden did a fantastic job cleaning our furniture including our linen couch. We were not expecting miracles as the couch was quite badly stained, most of the marks came out and they even gave it a scotch guard protection, which has made such a difference already. We also engaged Elite to do an exterior house clean where they apply a bug repellent spray (they did say it would need a repeat) We have found this to be invaluable. We have high… windows and for the first time in months they have remained clear of spider webs. The guys did suggest we do a fumigation inside the house, this is something we would like to arrange for late April when we are away. Can't recommend Elite highly enough." "Hayden was fantastic. Got you guys around after a tenant got another cheap company to attempt to clean the carpets. All the marks that could be removed were removed and the carpet looked so much better after its second clean. I have asked all other tenants to please use Elite otherwise they are wasting their money. Thank you so much a very friendly and professional service "
"Hello Marc, thank you so much for your feedback! We are so pleased to hear that you have had a great experience with our service and we look forward to being of assistance to both you and your tenants in the future. " "Hayden was professional, organised and arrived on time. The carpets look beautiful. He was at all times polite. Would definitely ask for him again." ""Thank you Fiona, we are so pleased to hear that you are happy with our service and we look forward to being of assistance to you again in the future!"" "Hayden and Dan arrived early this morning to clean our school carpets. Both were friendly and approachable from the get go. Took the guys through our premises and they set to work making our carpets clean and sanitized ready for our children to return. These two did an absolutely fantastic job and ensured the work was done to a high standard. They were fast, friendly, helpful, and I would definitely use them again and recommend this company and thier technicians Hayden and Dan. Thanks… guys!" "Hello Rayleen, thank you for your great feedback! We are so pleased that you had a great experience with Elite Carpet Cleaning and we look forward to being of assistance again in the future!"" "Excellent Service by Hayden and Dan. Hardworking ,Fast and quality carpets. Wonderful people .They really showed they loved their job. 10/10 service.Would Definitely book with them again. They cleaned three big classrooms ,our office carpet under 3hours. Carpets look great,smell great,more professional. Thank you for your guys services from Te Kura Kaupapa Maori O Te Kotuku." ""Thank you for your kind feedback Tiana! We are so pleased to hear that you are happy with our service and we look forward to being of assistance to you again in the future!"" "Elite Carpet Cleaning service surpassed excellent. Firstly, their dispatcher/bookings manager managed to accommodate us in their busy schedule at short notice and always kept me in the loop. In addition she rang up to let me know that the cleaners were running 15mins late (more often not you get no call at all). The cleaners themselves were courteous, very generous with quote versus the actual size of the job and cleaned our rugs beautifully. Highly recommended." "Hello Mark, thank you for your feedback! We are so pleased to hear that you had a great experience with Elite Carpet Cleaning and that we were able to tick all of the boxes for you! We look forward to being of assistance again in the future!" "I had a patch on my carpet causing a very bad smell and visitors coming to sleep in that room. All carpet cleaners were busy. I had a date for two days time then received a phone call saying that my carpet could be fitted in between other jobs. I was so impressed with Sean's approach. He quickly agreed that there was a problem. He worked with care and confidence and gave me very good advice. I am totally satisfied with the work that was done and will now use Elite carpets for future carpet… cleaning. I am very appreciative of that fast response to my urgent problem. Thank you very much. "Thank you for your great feedback Denise! We are so pleased that you had a great experience with Elite Carpet Cleaning and we look forward to being of assistance again in the future!"" "Needed an urgent carpet repair job done - on a Sunday! Sean came within 30 mins and did the small job very quickly, efficiently and was so helpful. Great work! " "Hello Virginia, thanks for your wonderful feedback! We are so pleased that we were able to help you with your urgent job and make things a little easier for you. We wish you all the best and look forward to being of assistance again in the future." "Ben came today to do a quote for me. He did a very thorough check for me and helped me find a leak underneath the carpet. He is very nice and helpful. Elite carpet cleaning will always my first choice." "Hello Emily, I am so pleased to hear that we were able to find the source of your problem and you were happy with our service. We look forward to hearing from you again in the future!" "This company is amazing. From the first contact, they took the time to fully explain the process and different cleaning options. They listened to so many questions and answered it so well. They are very knowledgable. The Elite staff member who came to do the steam carpet cleaning was very friendly, efficient and did an amazing job. Our carpets look amazing. I will be using this service again and strongly recommend them to anyone looking to clean their carpets. Bonus - their price was… absolutely reasonable! Thank you!" ""Hello Aleks, thank you for your fantastic feedback! We are so heappy to hear that you have had a great experience with Elite Carpet Cleaning and we look forward to being of assistance again in the future! " "This is the second time I have dealt with Elite. Amazing results for an 'end of tenancy' clean and then again in my own home. "Thank you for your lovely feedback Raewyn, we really pride ourselves on our service so it is fantastic to hear that we delivered on this promise to you! We look forward to being of assistance again in the future!" "Sean did a great job, very professional and thorough. Our carpet looks amazing! Highly recommend Elite Carpet Cleaning. " "Thank you Charlotte, we are so pleased to hear that you are happy with our service and we look forward to being of assistance again in the future!" "This is the second time I've used Elite. They are easy to deal with and do a brilliant job. Thank you so much Sean. Very happy with the finished result. " "Hello Sandi, thank you for your fantastic feedback! We are so pleased to hear that you have had a great experience with Elite Carpet Cleaning and we look forward to being of assistance again in the future. " "It’s refreshing to deal with a company that puts customer service first. From the very first phone contact until the job was finished, it was timely, professional and friendly all the way. Thank you to the team at Elite ! " "Hello Andrew, Thank you so much for your fantastic feedback! We are so pleased to hear that you were happy with our service and we were able to make the whole process easy for you. We hope you enjoy your lovely clean carpets and we look forward to being of assistance again in the future." "I have use them alot. Sean and the team are amazing they really provide the best customer service and do a great job! thanks guys will be using you again." "Thank you for your lovely feedback Brenda, we really pride ourselves on our service so it is great to hear that we delivered on this promise to you and we look forward to being of assistance again in the future!" "I rang Elite for an urgent job involving old dog and rather expensive mattress that needed a fast clean. I was given a time for the following day. However my job was fitted in between Brendan’s other jobs on the same day I rang and for a competive price. Very happy with the outcome "
"Hello Carolyn. Thank you for your great feedback! We really do pride ourselves on our service so it is nice to hear that we delivered on this promise to you and exceeded your expectations. We look forward to being of assistance again in the future!" "I can't speak highly enough of Elite Carpet Cleaning. They managed to fit my request in at very short notice and did an exceptional job, Very reasonably priced too considering the service and result achieved. I highly recommend them." "Thank you for your wonderful feedback Shane, we really pride ourselves on our service so it is lovely to hear that we delivered on this promise to you and exceeded your expectations. We look forward to being of assistance again in the future!" "Thanks so much for a job well done guys. Short lead time and good pricing. Pleasure dealing with you Abe and Sean." "Thank you for your feedback Jonas! We are so pleased that you were happy with our service and we look forward to assisting again in the future."" "Sean was prompt at giving me the advice I needed, and has saved us continued poor health by letting us know the house was high in moisture, dampness and mould. He was friendly, timely, professional and communicative ????????????????????" "Thank you Misty, we are sorry to hear that you have had ongoing moisture concerns in your property but very pleased that we could help to identify the issues and provide constructive advice going forwards! Please dont hesitate to contact us if we can be of any further assistance." "We have used Elite & Sean twice now, they are most professional, I don't look anywhere else & man they are great value in my book! Peace of mind..."
"Thank you for your feedback Peter! We are so pleased to be able to offer you the ever valuable peace of mind and we look forward to assisting again in the future." " We called Elite Carpet Care on Friday night and Sean was able to come first thing Saturday morning. He arrived on time and cleaned our carpets very thoroughly. The carpet is surprisingly dry and smells great. Highly recommend this The carpet is surprisingly dry and smells great. Highly recommend this company." "Hello James, Thank you very much for your feedback! We are so pleased to hear that you had a great experience with Elite Carpet Cleaning and we look forward to being of assistance again in the future!" "Fantastic job by Sean. Punctual and professional. Sean was genuinely interested and concerned about doing the best job he could do for us..Thanks for a great job. We will always recommend you ." ""Hello Andrew, Thank you so much for your fantastic feedback! We really pride ourselves on our service so it is lovely to hear that you have had a great experience and we look forward to being of assistance again in the future."" "Superb service, very professional staff. Kept me informed with the progress of the state of my flooded carpet and laminated floor using advanced measuring devices. Friendly, punctual. I would not hesitate to use or refer their service again. "Hello Mohammed, Thank you for your choosing Elite Carpet Cleaning for your flood restoration requirements! We are so pleased that you are happy with our service and we look forward to being of assistance again in the future!"" "Great job cleaning my carpets, with 2 big dogs and a handful of kids set on destroying the carpets, and treating the two sets of stairs like a race track. I was happily surprised that Dan knows carpet magic and made them look like new. No problems from the first phone call right through to the final handshake." "Hello Anthony, Thank you for your fantastic feedback! We are so pleased that you had a great experience with Elite Carpet Cleaning and we look forward to being of assistance again in the future!"" "The Elite team was prompt and friendly, the carpets look fantastic, and it was very convenient for me that they accepted EFTPOS & credit card. I was really impressed that they moved the couch to clean beneath it, and were able to remove an old soy sauce stain I had thought would be there forever." ""Hello Tanya, thank you for your fantastic feedback! We are so pleased to hear that you have had a fantastic experience with Elite Carpet Cleaning and we look forward to being of assistance again in the future""
"I had the BEST experience with Elite carpet cleaning. They were prompt, easy to communicate with, professional and Sean did a fantastic job with my carpets. I will use them again in the future for my home and rentals. " "Hello Monique, thank you for your fantastic feedback! We are so pleased to hear that you have had a great experience with Elite Carpet Cleaning and we look forward to being of assistance again in the future. Have a lovely day :-)"
"AMAZING!!! Dan managed a patch repair on I spot I thought was beyond repair. He was friendly and very easy to deal with. Couldn't fault the service, from ease of booking and knowledgeable office staff to professional and competent technicians. a must call even if you think its "beyond repair" "
"Hello Joel, Thank you for your wonderful feedback! We are so pleased to hear that you had a great experience and you were happy with your carpet repair!! Please don't hesitate to contact us if we can be of any assistance in the future." "Just wanted to let you how amazing I thought your service was. 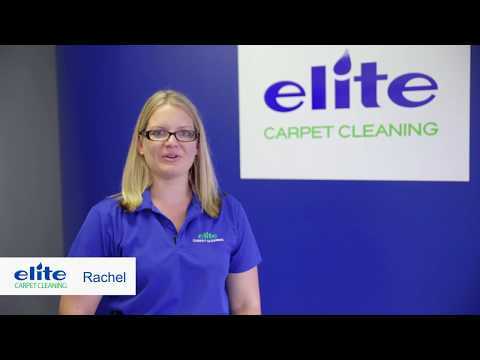 I was involved with Elite Carpet Cleaning a few weeks ago and I was so impressed with your staff, their friendly and super helpful and efficient service – they were more than AMAZING! Friendly, helpful and patient. And the guys on the job were great as well. This really makes such a difference when dealing with a company – I will certainly keep your card for anytime I may need your services in the future. Keep up the great… work!" "Hello Jennie, Thank you so much for your fantastic feedback! We really pride ourselves on our service so it is nice to hear that you have had a great experience and we look forward to being of assistance again in the future." "Now I am in my eighties and living alone I find dealing with business people a bit daunting,so I am very glad I chose Elite. Rachael made it all so easy and Dan did a great job. He was quick cheerful and friendly, rejuvenating my tired carpets in no time at all. Thankyou Elite." "Hello Carole, Thank you so much for your fantastic feedback! We are so pleased to hear that you were happy with our service and we were able to make the whole process easy for you. We hope you enjoy your lovely clean carpets and we look forward to being of assistance again in the future." "Amazing. Reliable, efficient, cost-effective. What more can I say, this is how every company should be. "Hello Cheryl, Thank you for your feedback! We are so pleased to hear that you had a great experience with Elite Carpet Cleaning and that we were able to tick all of the boxes for you! We look forward to being of assistance again in the future!" "Great service! Very professional. Will definitely use again." "Hello Shona, Thank you for your great feedback! We are so pleased that you had a good experience with Elite Carpet Cleaning and we look forward to being of assistance again in the future!" "I used this company due to the positive feedback on this site for carpet cleaning a rental property. They were super quick to attend and did a good job at a good price. I would happily use again. Thanks Elite and Brendon !" "Friendly company and fast efficient service. Top job and I would definitely use elite again. Highly recommend to all. "Fantastic service, great results, carpets looking fantastic and sofa's upholstery cleaned up brilliantly. " "Elite came to the rescue when we had a disaster experience with another carpet cleaning company. The technician was friendly and explained complex information simply and easily. They offered to write a letter for our insurance company if we decided to claim for the damage caused by the other company. The fee was reasonable. I will definitely use them again in the future as my go-to company for anything carpet related. " "Great service, have used Elite twice now (once for flooding and once for a pet accident clean up) and both times they were awesome, they came out same day and sorted my issues. They have great equipment and I felt like they really knew what they were doing. I will definitely continue to use them in the future. " "I have used elite now for a number of years and just love the service. They do a great job and are more than fair with prices. I can't rate the service I get enough. I discovered the kids had sprinkled TUMERIC all through the house on my 3 month new carpet. elite turned up the next day and got it out. " "If you are looking for friendly and great service, a job done super well then these are your guys. Had ours done a few times and always 100% happy everytime. :-)"
"This is the second time I've used the Elite team. They are super helpful, super nice and they do a great job. I would highly recommend them to anyone. Thanks for another fabulous job!" "Thank you Christina, we are so pleased to hear that you are happy with our service and we look forward to being of assistance to you again in the future!" "Quick quote/booking response from the office! Very professional and thorough job done, carpets look amazing! Will def recommend in the future, we even have them coming back soon???? Thanks for the brilliant service!!" "Thank you Magz, we are so pleased to hear that you are happy with our service and we look forward to being of assistance again in the future!" "Arrived promptly, did a great job and was a very knowledgeable guy. I learned a lot from him!" "Elite were fast and friendly to work with. Did everything they said they would, arrived on time and offered to fix anything is not happy ( wasn't needed). Would definately use again." "We had a great experience with Elite Cleaning. We had 3 rugs in desperate need of a clean. Sean from Elite was easy to deal with, turned up on time and realised we had a small child so proactively used eco products on our rug for safety. Our rugs look brand new! We will definitely be using Elite Carpet Cleaning again." "Very nice company to deal with. They did everything promised for a good price. Nice professional clean for an end of tenancy requirement." "Excellent job carried out efficiently and on time. A small problem fixed promptly. Would definitely use again." "Rachel is very polite & professional. Shaun did a perfect job on our dirty carpet. We have a dog who had changed the color of our carpet. Shaun arrived well before time, explained us the process & carried on with the job. Shaun noticed tiny marks on the carpet & tried to remove them. 10/10. Will definitely promote your business amongst our friends & Colleagues at work. Worth every penny. "Brendan turned up right on time and got stuck in. I am very happy with the job. Brendan is a great advert for your services. Would definitely use Elite again. Service from Rachael in office was also outstanding. Quote was quick & accurate. These guys are on the ball!" "Right on time... pleasant intro and excellent efficient service with attention to detail .. unrushed service by Brendon and very obliging to boot. Very pleased with this service and will certainly use again on past performance .. pleased to say I can highly recommend." "Came almost immediately and did excellent work. Highly recommended." They are absolutely fantastic, honest and reliable. They will always go out of there way to help us out. "Arrived on time. Very impressed with the standard of service & the advice given. Finished on time. Price reasonable .Highly recommended." "We utilise Elite Carpet Cleaning for Home, Office and also refer them to our clients on a regular basis. Always professional, punctual and personable!! " "I had a flood, called our insurance provider and elite was sent, all sorted in a few days, dried out and cleaned the carpet and even relayed it, all before Christmas! Great, fast service, thanks." "Great job on the carpets guys . " "Great job. Very professional. Would recommend them to anyone." "Sean did a great job as usual. On time and very reasonably priced. Highly recommend Sean and the team!!" "Absolutely fantastic service and execution of the job! Would definitely use again and recommend to all. Thank you Elite! " "Shaun was very helpful and removed all the stains that I thought would never come out! Great price as well"
"fantastic service and they were on time also very friendly and a superb job im am very happy with this company i wiuld recomend them to every one"
"A great job by Sean and the team! Our cream settee and stool need a clean each year and these guys really make in glow! The rug and carpet looked fantastic! Cheers Guys!" "Elite Carpet Cleaning are efficient, well presented and easy to deal with. They did a great job with our carpets. I would highly recommend them." "Sean is a great worker and my carpets look fantastic. I thoroughly recommend Elite Carpet Cleaning"
"Sean and Rachael are fantastic, we have used them many times with no problems. Highly recommend Elite Carpet Cleaning and will be continuing to use them in the future. " "Great job, friendly tradesman. On time in budget. What more could you ask for. Highly recommended!" "Outstanding fantastic carpet cleanings, prompt go out of there way to help communicate and follow up! Highly recommend them. " "Great Service, came on time , excellent results, recomended"
"Sean and Rachel from Elite Carpet Cleaning have taken excellent care of my carpet cleaning/stain removal requests over recent months (and in the past). I only use Sean and Rachel. They have proven very reliable - coming within days and on time. And, of course, the result of the clean/stain removal is impressive." "Great, fast, friendly service, thanks." "I highly recommend Elite Carpet Cleaning - for professionalism and quality of service. I was running late so had to rely on the technician to let himself in. All was fine he was incredibly polite and the carpets looked great. Would definitely use Elite again. Thank you." "Just had our carpets cleaned by Elite Carpert cleaning. I choose this company to use after alot of google searching as I like to support small NZ owned business and they had heaps of great positive feedback. They certainly lived up to this. Very friendly service and advise from Rachel when I called up to book the job. Then Brendon came and did the clean. He arrived on time. Was very friendly and explained everything and did an excellent job. Very impressed and will definitely be getting… them back again." "Spoke to Rachel to get a quote and she was very helpful. Brendan arrived to do the job at the appointed time and we are very pleased with the result. Carpet looks and feels fresher and we were very pleased with the good value for the price. Would definitely use Elite again." Thanks you I will use no one else but Elite to clean my carpet from now on. " "Moved in to a new house, had flee treatment done and carpet scrubbing with steam clean as old owners had 1 cat and 2 dogs! Great service, great result and no more flees or pet hair, thanks to the team at elite carpet cleaners. " "Daughter had used elite twice before so decided to give them a call when we wanted our yearly carpet clean done. Sean at Elite was great - we rang and organised for the day we wanted and he did a great job, even made time to clean a rug that I had forgotten to ask about when I booked them. Awesome job thanks, will use again"
"They made everything ridiculously easy for us to organise and the technician did a great job. I have already recommended Elite to others and will continue to do so." "Today was the second time we have used Elite and the service and professionalism was just as outstanding as last time. Our technician was friendly and extremely thorough. I wouldn't dream of choosing any other carpet cleaning company." "Outstanding service and value for money. Technician was prompt, friendly and very professional. Would not hesitate to use again or recommend to others. " "I booked Elite for the first time after reading the NoCowboys reviews. It was great to be able to book a visit over the phone at short notice to coincide with a day at home. On the morning I had a call from the guys to see if they could come earlier and they turned up exactly on time. These friendly professionals did a great job on my carpet and it was an added bonus they could accommodate my request to spruce up some sofa cushions. Thanks Elite, you will be booked again. " "Got the house groomed by this company and had no issues. Were on time and hammered out the work no worries. End result was great. Myself and wife extremely happy with work done and will be using this company again." "Got the guys to clean the carpets at a rental property. Excellent service, on time, great job and amazing follow up to ensure we were happy with the job." "Great, friendly service and the couch came up better than I thought it would. Much better than the previous guys I used. Will definitely use Elite again." "Third time we have used Elite - we don't call anyone else now. They are great to deal with re bookings, and cleanings have always been done just how we like them - professionally." "Great service, the guys arrived on time, neatly attired and very professional. After a quick look around they got stuck in and had the job done in an hour. Got all the stains out and left the carpet like new again. Throughly recommended." "A+ service . removed all traces of cat pee from my $700 car seats . would use their services again"
"AMAZING!! A brilliant result from Elite I am so happy!! I rang them at midday and they were at my house at 5pm and its like the stains never even happened... I would recommend Elite to anyone and I will use them again for sure!! Communication was excellent and right on time as well as very personable - excellent service! They even have an EFTPOS/Credit card machine so I didn't have to make a trip to the ATM." "Best carpet cleaning experience yet! Courteous, professional, great value, punctual & absolutely the best quality carpet clean hands down; the carpet has been totally revived. Very highly recommended." "I have used Elite Carpet Cleaning at home and at my place of work, I find it so simple to make a booking i simply just phone the 0800 number and get a polite and helpful young lady down the other end of the phone. I give her my info and a time that suits and the technicians have turned up well presented, well mannered and ON time. They did amazing jobs on my carpets both at home and work! I will be useing them in the future thats for sure. Thanks guys! Great Work!" "This is the 2nd year we have used Elite. Having two labradors we asked for a deep scrub before the cleaning to remove any dog hair the vacuum can't pick up. From the friendly and helpful lady who first takes my call to the guys who do the carpets the service is exceptional and reasonably priced. I won't be using any other company to clean my carpets. " "Excellent job done by the Elite guys. I will definitely be using them again." "Fantastic work. I was very impressed with Elite from the first point of contact through to the carpet cleaning. The lady who answered the phone was very helpful and was able to make a booking for me the next day. The guys turned up on time and were professionally presented (tidy uniforms and a clean van). They did a great job at cleaning the carpets and didn't leave behind any mess. I will use Elite again." "Fabulous service - were able to come next day for me. Sean arrived on time & did a fab job on our carpet rug & did a hallway runner & front door mat at no extra charge. My carpet has had 6 years of tenants - was filthy & is now sparkling clean!!! Would totally recommend - thought price was very good too!" "Fantastic service! Had just moved out of the house, our original carpet cleaners never showed so my mother called Elite early on a monday morning and they came the same day and did a great job. Decent price too. Will use again"
"Great service and communication from this company. Would definitely use them again." "I contacted this company for a carpet clean in our new, empty house and from the outset they were pleasant, efficient and cost effective. I am impressed with their eco friendly cleaners and was impressed when they offered fragrance free products for my husband who has allergies. I wasn't present for the clean but was assured by my mother that the technician was extremely quick and thorough. We are delighted with the job that was done and will certainly use them in the future. " "Available at short notice, friendly, on time, quick and reasonably priced. Would definitely go with them again and recommend them to others." "The booking was very easy and everything else happened automatically. They arrived on time, executed the job nice and quickly and very customer friendly. Thank you"
"Arrived on time. Friendly, polite and happy to explain things along the way. Aaron worked efficiently to get the best out of our very grubby lounge suite. Thank you. We will definitely use your company again." "Excellent service from the first phone call to the end product. Great value, excellent job and the carpets and furniture have come up extremely well. Will certainly recommend." "Great job, friendly service, arrived right on time. Have already recommended to friends, and will be a return customer." "Very professional and friendly service. An old stain in our carpet is a lot less visible and we will get them on to any future stain immediately. Highly recommended. " "nice job, best value for money, have already recommend to friends! " "They were great, we are very happy with the result, very good value for money, and they did the best to fit in our busy schedule :-)"
"Rang them at short notice and they were so nice and squeezed the job in just before a long weekend. The guys were friendly and very efficient, they did a great job and I wouldn\'t hesitate to use them again or recommend them to others." "Brilliant service!! With 2 cats, 2 dogs and 2 kids under 4 our very light coloured carpet was revolting!. The end result was that i walked in and wondered if they replaced the carpets! Will happily use again and have already recomended to others." "Great service! Priced very realistically and our carpets are noticably cleaner. Old stains are less visible we were given good advice for future stains. Im recommending this company to everyone i know. Thank you guys for such efficient service. We are very happy with the result. " "My carpets and mats look like new again thanks to Sean and the team at Elite carpet clean! A very professional and friendly service. Quick and easy to organize, taking the hassle out of moving house! Thanks Sean, I really appreciate it. " "Fantastic company. Arrived on time. Rachael was very understanding as they could not get in the first time they arrived. Made a second appointment for the next day. Again arrived on time and were quick to complete the job. Price was very reasonable and carpet looks lovely. I would not hesitate to use them again." "I had a job at a rental property that needed dealing with in a day or so. I spoke to Rachel at 9.30 and her team were at my property by 12.30. They did a great job - quick, efficient and good value for money. The carpets hadn\'t been cleaned since new (6 years) so it wasn\'t the easiest of jobs. If you want easy and affordable, choose this company. I\'d recommend their services and use them again in the future! Thank you so much! " "We had a disaster today. Our cat walked black ink through every room in our house staining our beige carpet. Sean came immediately and cleaned it all up. What a friendly and helpful guy!! Thoroughly recommended." "Quite simply, if you appreciate top quality work, attention to detail, punctuality and someone who is honest and reliable, look no further than Sean at Elite. He turned up on time, was very personable, told me what he was going to do, what the treatment entailed and how long it was going to take. I had already got another quote for the same job and Elite were the same price. The quote was exactly as described over the phone and nothing extra. My decision to go with Elite was because of the… ratings that I saw on this site. Sean delivered exactly as he promised, ahead of time. An exceptionally satisfied customer who will continue to use Elite in the future. If all businesses were as good as this, there would be no need for No Cowboys." "Elite Carpet Cleaning is great. Sorry I cannot remember the dude\'s name. I booked two jobs with them. All are completed very well and the carpets are very very clean. By talking to the guy, I learned that this is his family business. He has been helping out his dad with the cleaning jobs since he is young. He gave me feedback on the jobs he has done for me. e..g there is some paint he cannot get rid of from the carpet, which is understandable. He also asked me how I find them. This just shows… he cares about the business. I am very happy with Elite Carpet Cleaning and wouldn\'t hesitate to use them again." "Sean arrived on time and finished the work promptly. He was friendly, informative and reduced the charge when he said my carpets were not in need of the original quoted services. Only strange thing was that he was still wearing his shoes when he came in to do the carpet so there was a little dirt left over from that, but other than that, excellent! =)"
"Sean did a great job for us. Carpets were left in great condition in our old and new property. Upholstery also protected. Really friendly and helpful. Would recommend to anyone." "Sean and the Staff were fantastic to deal with and the job was done on time and at a very reasonable price. I will definitely be using Elite in the future and recommending to my friends. AAA"
"Great company to deal with from the office lady who organised our booking to Sean the cleaner who was extremely organised and on time. We were extremely impressed with their service and would not hesitate in recommending them to others." "We would like to thank Sean for a fantastic job with cleaning our carpet - he was prompt and reliable, and went the extra mile in several aspects: stain treatment, lifting light furniture, cleaning our mats, lending us two carpet dryer units (as it was an overcast day) and using the carpet scrubber to ensure a deep, thorough clean in our son\'s room as he has asthma (all at no extra charge). We found Sean to be efficient and extremely thorough, and we are thrilled with the results (our… carpet is soft and clean, just like new!). We have no hesitation in recommending Elite Carpet Cleaning, and thank Sean for his excellent serice. K & M Wong, Albany"
"Highly Recommended ! Sean was very friendly. I was 100% satisfied with the job he did on my carpets. I would definitely recommend Sean to people who need carpet cleaning service. "Shaun responded to my phone call straight away and a booking was made at a time that was convenient for me. He showed up on time and his cheerful attitude toward the job made him a very approachable person. He did a extreemley thorough job of cleaning my couch and spent extra time on the spots that required a little more work. my couch looks like new again and smells great. i will definatly be using elites services again in the future. " "Was very pleased with the customer service from Elite. Cleaning was done within 2 days of my contact. Shaun was prompt and very friendly. Carpets looked great. No hassle and excellent service. Thank you." "Very professional and friendly service, excellent job on some quite dirty sofas. I wouldn\'t hesitate to use them again, and I highly recommend them." "Just like to say thanks for the lads that came around to clean my carpet today. Both very friendly and exceptionally professional. Excellent service! I will definitely be using Elite again. "Polite, punctual, excellent job, very reasonably priced"
"Sean did a great job on the carpet. Would recommend them to anyone and definitely use them again." "Rachael and Sean are both very helpful. Great to deal with! They did an awesome job for us. Highly Recommended to all our tenants and everyone! Kind Regards Goodwill Property Management." "Elite carpet cleaning were excellent, Inspected my carpet and explained their action plan well before and after treatment. Carpet wasn't soaked like many others I tried, dried quickly. They even cleaned all my loose rugs and upholstery witch now looks like new and gave me solid advice. I would highly recommend them. Although they are not the cheapest they are worth every cent!! "Sean was great, we phoned to obtain a quote on cleaning our 2x offices and hallway. Sean was here the next day and on the time he stated. Sean was able to remove the coffee stains and the carpets could be walked on straight after he left. Great service and we look forward to using Elite Carpet Cleaning in the future. " "I had a flood from my dishwasher l late Sat night and called Sean. He promptly came out and sorted everything at a very reaasonable price (Cheaper than other companies I spoke to!!). Sean left drying equipment behind and returned a 3 days later to check on the job at the time he said he would. I thought it was really cool that a week later Sean contacted me to check that everything was ok and I was happy which I was. I was really impressed with Seans professionalism and the fact that he… genuinely cared about how the job turned out. I will def use Elite again and I would recommend Elite to my friends! Quality workmanship and a really good price. Good on you Sean you saved me from the wife freaking out and I appreciate that you went the extra mile. Very happy :)"
"Sean is fantastic. I highly recommend his service, he is knowledgeable and thorough!" "Having had a lot of pets in the house over the years, the carpets have been in need of a good clean -- and although I\'ve had many different cleaners come in, none of done such a good job as that of Elite Carpet Cleaning. The carpets look lovely and fresh and smell divine. Mr Thomas was prompt and efficient in his work with a lovely disposition, and his prices were extremely reasonable considering how beautifully the carpets came out. Thanks!" "excelent job and cheap too will recomend elite too anyone needing their carpets cleaned "
"professional service and arrived on time. Cleaned our rental house and made the carpet look like new! The man was friendly and honest about which stains would come out, surprisingly the toughest stains came out! Having been let down before by other carpet cleaners i will definitely only use Elite. Will be reccommending Elite to Friends and Family.- very impressed with Elites work. Thanks Jess! "Fantastic job! It is rare for a trades person to be on time but you impressed with a job well done, on time and in short notice. Thanks heaps. "Great Job, carpets now look like new again!. and they got 90% of the stains out, 10/10 for elite carpet cleaning and thanks so much :) "
Elite Carpet Cleaning offers a professional, friendly and thorough steam cleaning and flood restoration service for both residential and commercial properties AUCKLAND WIDE - from Bombay to Mangawhai and everywhere in between! As a member of the Carpet Cleaners Association of New Zealand (CCANZ) and the Institute of Inspection, Cleaning and Restoration Certification (IICRC), Elite Carpet Cleaning holds themselves to the highest standards of workmanship, professionalism and customer service. Based and operating in Auckland, our institute-certified technicians use both portable and van-mounted machines, combined with Eco-Friendly products to provide a thorough clean that is safe for you, your family and the environment!! Catering to Commercial properties, Residential properties and Insurance Company's our services include steam cleaning of all types of carpets, upholstery, rugs, mattresses, carpet patch repair, carpet starching, laying as well as an Emergency Flood Response Service. All Vans have Mobile EFTPOS & accept Credit Cards.